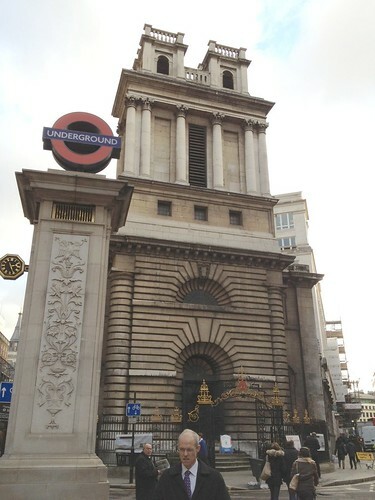 The hidden Underground of St Mary Woolnoth | London My London | One-stop base to start exploring the most exciting city in the world. At Christmas time God and Mammon declare a truce. 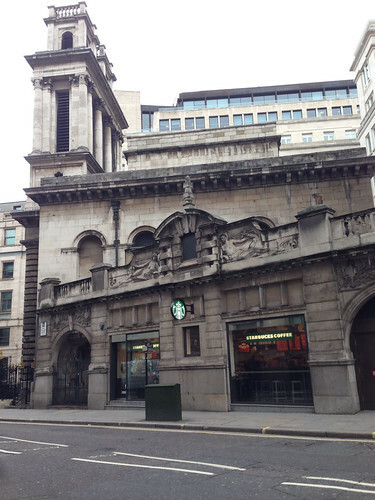 So, no better time to visit Nicholas Hawksmoor’s awe-inspiring Baroque masterpiece, St Mary Woolnoth (by Bank station) which only exists because of compromises made with Commerce as can immediately be seen along one of its side walls (left) which has a Starbucks fitted into it – yes, a Hawksmoor Starbucks. In another bit of privatisation, part of its churchyard was sold off long ago to the City Corporation so the Lord Mayor could build his official residence, the Mansion House there. But the biggest compromise was in 1897 when, having survived several attempts to pull it down, the church was faced with the City and South London Railway which wanted to demolish it to build Bank station. Permission was granted and it was only saved by massive public opposition. The result was a deal: the crypt was sold and now actually forms part of the station while the church was underpinned with steel girders making it stronger than before. You can see part of the old crypt ceiling above the lifts near the exit to the station. Its luck held out in the Second World War. It was the only City church to escape unscathed. The church itself has charisma bordering on the sublime. Outside, it looks like a Greek temple sitting on a sculptural base with angular parallel lines that wouldn’t look out of place at Tate Modern. At the top there are two archways – leading it seems to a free fall – which look like eyes watching over the City, balm to Hawksmoor’s psycho-geographic disciples who read mystical interpretations into practically anything he has built. This is no ordinary church having been a place of worship going back 2,000 years to pagan times. Inside, you are struck by four sets of Corinthian columns laid out as triplets in what Ian Nairn described as “a square within a square . . where space is made so tangible that you can experience for the price of a bus ticket to the City, the super-reality of the mystics”.